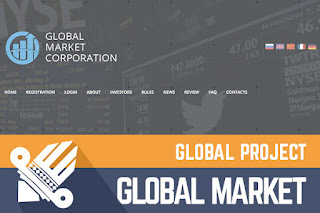 Global Market is another Golden Stage project that joined our monitor lately, to be precise administrator decided to join us on 13th of April and I reinvested $400 into Global Market for monitoring purposes. 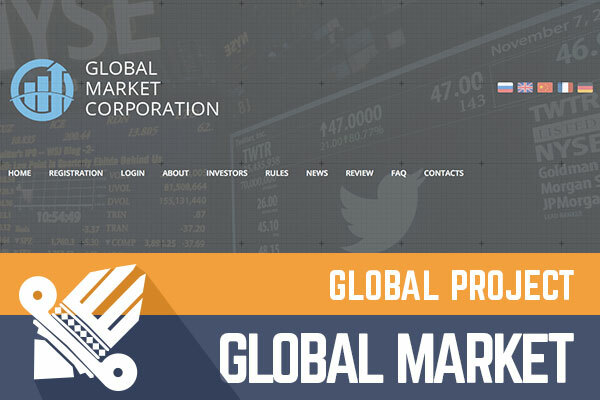 Website of Global Market is translated into five popular languages and already for more than 50 days, it offers services to HYIP investors around the planet. Yes, as I wrote in introduction website is available in five languages, and I must say that this is a crucial element when an investor decides where to invest. If the decision would be about the project that is similar but has just one or two localizations investor would invest in the second one, respectively into Global Market. Various localizations certainly is not the only thing why someone would favor Global Market, but a simple website and simple user interface makes it even more attractive, thanks to H-Script. Yes, Global Market is based on H-Script, and it is very popular among administrators that come from Russia or some other CIS country. Sure thing I can't verify if that is the case also here, but I sincerely believe that. What does that mean for us? It is just a sole fact, and overall projects from these countries perform as good as from any other region. There always is some project that close fast and some that last for a very extended period, and I hope Global Market is that second type project. Global Market is kind of "piggy bank" project, and such projects were very trendy one year ago when 70% of projects were such kind, but this time there is one distinction from standard "piggy bank" - you can't withdraw your initial deposit. The thing is - when you will deposit your money will be locked in for "lifetime", of course with lifetime I mean the moment when the project will stop paying, but judging from relatively low-interest rate I'm sure that this day will not arrive that early. To sum up that I wrote earlier, I can say that "piggy bank" trend these days apparently is gone, and I think that Global Market administrator is quite brave to produce something different than other projects these days. Global Market for certain is worth watching, and I have this feeling that it have a great prospect to gain huge popularity among investors today. Even I'm positive about this project remember that this is still an HYIP and treat it like any other HYIP - invest only that you can afford to lose. Investment plans: 1.5% up to 2.5% daily for unlimited time. Did you consider using the #1 Bitcoin exchange company - Coinbase. Have you ever considered automating your free satoshi claims with a BITCOIN FAUCET ROTATOR?